The Alabama Consortium for Technology in Education (ACTE) Region One Technology competition is open to all Alabama students in grades three through twelve; whether students go to a private or public school, learn at home, or sponsored by another organization. Students may create projects in a broad range of categories either individually or in a group of no more than four students and may register a combination of up **TWO** projects. (Project count does not include the TECH FAIR TEST or TPC). 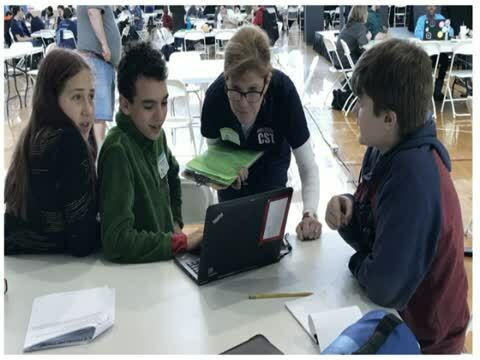 Additionally, students may compete by taking an online Information Technology (IT) test and participate in the Team Programming Challenge (TPC). The IT test comprehensively tests student's knowledge on a variety of general technology topics. The TPC is a timed exercise where teams of students grades seven through twelve are presented challenging programming problems to solve. The University of Alabama at Huntsville (UAH) Colleges of Engineering and College of Science are our sponsors this year. A special thank you to Dr. Shankar Mahalingam, Professor/Dean of Engineering; Dr. Emanuel Waddell, Professor/Associate Dean of Science and Dr. Bernhard Vogel, Associate Professor of Chemistry in the College of Science and Assistant Director of the Nuclear Magnetic Resonance Lab (NMR) for their collaborative support. Our goal is to provide students a means of preparing for the digital challenges of tomorrow!